Lee Ann Womack has one transcendent hit that carries her out of the somewhat provincial context of country music and into the broader collective memory. The 1999 single, “I Hope You Dance,” is her only number-one Billboard hit, as well as her only solo Grammy win. It’s a classic rite of passage song, because its lyrics are boring, expansive, and the kind of thing you would put on an embroidered pillow: “I hope you still feel small when you stand beside the ocean / Whenever one door closes I hope one more opens.” It’s saccharine junk that moves something in you against your will. It’s the sort of song that endures and endures, and we’re all sorry, but what can we do? She played it near the end of her Tuesday show at Williamsburg’s Rough Trade record store, on a cold, rainy night, tucked into a 250-cap venue that serves both 16-ounce Budweiser cans and espresso. She played it, and—along with 70 grownups in sensible fall coats, one full cowboy, one woman in knee-length fur, and one possible Kicking and Screaming extra with a straw between his teeth—I cried. When she was done, she clasped her hands under her chin and beamed down at the audience like Mrs. Claus. Lee Ann Womack’s 2004 greatest hits compilation was one of my first beloved albums. It sat in a blue, plastic CD organizer next to Martina McBride, Faith Hill, and Sara Evans. For better or worse, while I orbited a 10-mile radius of my dying farm town until college, everything I knew about being a woman was taught to me by female country music vocalists. There was a lot of boys and beer and thin-lipped subservience. There was a whole lot of American dream. But there was often, also, a sly rebellion—a grimace behind a domestic ballad, a back-handed compliment in a love song, a kiss-off track that ventured a few harsh words past decency. Martina McBride’s “When God-Fearin’ Women Get The Blues.” Faith Hill’s “Stealing Kisses.” The Dixie Chicks over on a whole separate plane, the exception that proved the rule, and a miracle to me. I still love these songs, and I still think it’s incredible that the women of country music managed to be so absurd within such absurd confines. 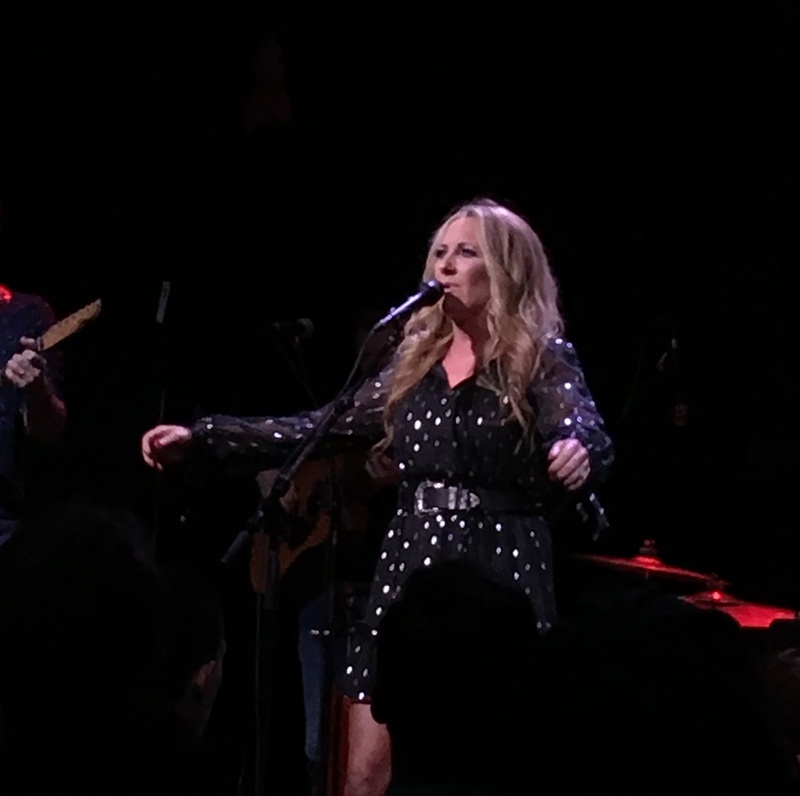 On Tuesday night in Brooklyn, Lee Ann Womack sang, absurdly: “Oh mama, the way that I’m livin’ / If I ever get to heaven, it’s a doggone shame.” She wore a black dress with billowy sleeves and silver stars, and her pile of blonde hair twisted and frozen into curls that looked like they were made of rock. She looked like a witch, in particular when she pulled her full band of lanky dudes in closer to her and started talking about her hometown in East Texas. “It’s dark there,” she said. “My husband always says ‘it’s dark under those pine trees.” It was the introduction to a cover of a song about a ghost — ”The Long Black Veil,” made famous by Johnny Cash in 1965. This extremely creepy song was written by Marijohn Wilken in 1959, which Womack pointed out when she was done: “A lady wrote that song. And I wrote this next one.” I shivered, and loved her, loved her. The whole album is, it turns out, wonderful. It was marketed with a black and white photograph of Womack staring miles past a lit cigarette. The title track is a tribute to Hank Williams. A pair of ballads at the center—“Shine On Rainy Day” and “Mama Lost Her Smile”—are perfect 200-word short stories. The first is about a male friend asking Womack to write a happy song for once. “Ain’t it funny how a little thunder can make you wonder, should you swim or just go under?” she muses, a sad-song-within-a-sad-song, just to spite him, underlining it with a gripping, bluesy guitar lick. “I got fiddles back on the radio with this one,” Womack said, near the end of the show, winking before she launched into “I May Hate Myself in the Morning,” from her 2005 album There’s More Where That Came From. If you haven’t heard it, I’m sure you can guess what it is. It’s a song about premeditated regret and romantic stupidity, unfolding lazily, over production that can only be described as twangy-tropical. It’s 12 years old and it sounds older, like it was written for Reba McEntire in her mullet days. I don’t know if Lee Ann Womack cares about being cool—or that I care about anything being cool—but if she’s going to do shows in the backrooms of Williamsburg record stores, it’s certainly flitted across her mind. At the very least, she must care about being relevant. Working within a genre associated with an antiquated American attitude while making music that feels “timeless” in a nicer way is sort of a dicey endeavor. Womack also played “The Lonely, The Lonesome, & The Gone,” a nostalgic song that bemoans the state of Nashville today—no more jumping onto trains and vanishing, no more making it “sound so cool to be a half-drunk heartbroke fool.” I can see why someone might miss the romance of those things, but hearing that longing for a distant version of a Southern city made me suspicious of her for a moment. I ended up listening to her final song from the bathroom (two PBRs!). It was from the CD I owned in 2004 and its chorus was a delicious blaze of melodrama—“AS MUCH AS YOU’VE BURNED ME, BABY / I SHOULD BE ASHES BY NOW”—that shook the stall door. I could hear people roaring. I opened Twitter and scrolled through the results of the day’s elections, beaming until I hit a deeply obnoxious tweet from a recent crush, which I texted to two of my coworkers before I left.